The economy may be struggling, but for anyone who still has a budget for holiday gifts this year, these are boom times: Retailers like Walmart and e-tailers like Amazon.com have already begun to roll out the bargains and, as usual, a great deal more are expected to arrive on Black Friday and Cyber Monday—the Friday and Monday following Thanksgiving. According to Shop.org’s annual 2010 eHoliday pre-holiday retailer and consumer surveys, for example, four out of five online retailers (84.8 percent) plan to offer free shipping and the terms may be more generous this holiday season than last. That's because 36.7 percent of the online retailers surveyed told Shop.org that they've boosted their free-shipping budgets this year. But how do you find these deals online, and how do you know whether a deal really is a bargain? There are websites dedicated to finding and sharing all the deals from almost any major retailer or e-tailer you can name, offering coupons and discount codes that can be used either online or in-store. And some sites go further, to advise you on why the offers they show are good, middling or bad values. Plus, add-on applications from Billeo for Web browsers alert you to special offers based on your keyword searches within Google, Bing and Yahoo!. Here are some of those sites and add-ons that, after a bit of admittedly unscientific web surfing, we liked best—and that we suggest you check out yourself online today before you stand in line at your local retailer tomorrow. 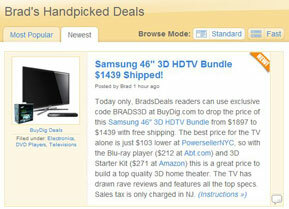 BradsDeals.com employs a team of bargain hunters who scour the Web and printed advertisements for both coupons and what they consider the best values, among special offers in 58 product categories, including electronics, jewelry and kids toys. The BradsDeals home page clearly organizes the coupons in separate sections; one covers “printable” coupons to be used in stores, the other “online” discount codes to be used at e-tailers. Meanwhile, the handpicked deals are organized into three areas of the home page, for Today's Hot Deals, Most Popular and Newest. And each deal listing includes product information as well as some explaining why the BradsDeals team believes it is a good value. 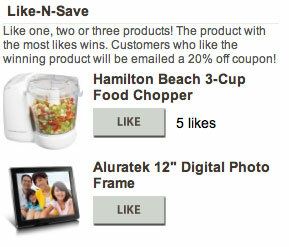 Each deal’s own Web page also shows prices for the same product at competing sellers, as well as related coupons. Additionally, Black Friday-specific deals are being highlighted in a separate, dedicated site created by BradsDeals: BlackFriday2010.com. Retrevo.com is limited to consumer electronics products, but covers the field extensively, with informed analysis and commentary on products in 53 categories—including advice on whether a product is worth buying, deal or not. Deals from across the Internet are found by either Retrevo’s employees, who manually search the Web and store circulars, or by the site’s computers, which “crawl” the Web looking for specials. Each deal is then evaluated by comparing the sale price to the product's "fair price", as determined by Retrevo. When the price drops significantly below the fair price for the product, Retrevo flags the offer as a good deal. You can also search for Retrevo’s take on any consumer electronics goods you’ve already found elsewhere. A “real time review” on each product’s page includes both its fair price and a “lifecycle graph“ that depicts whether the product is new, “reaching its prime,” “over the hill,” or “ready to retire” and be replaced by a newer and better model. An overall recommendation—thumbs up, down or sideways—takes into account the opinions of Retrevo users, customers at e-tailers such as Amazon.com, and professional reviewers at other trusted sites. Retrevo's Marketplace section, its own online storefront, offers daily deals exclusive to the site, posted every day at 12 PM Eastern time. These deals are in effect for 24 hours or until a product is sold out. A “browser app” from Billeo, named the Offer Assistant, is an add-on for Firefox (Mac and Windows) and Internet Explorer (Windows). The Offer Assistant displays online offers from merchants and credit card companies on the Web search results pages generated by Google, Bing and Yahoo! 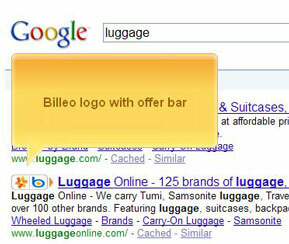 Search for, say, “Samsonite,” and a bar with a Visa logo and embedded cash back offer may appear next to a link to an online luggage store. At the checkout page, when you’re ready to complete the purchase, an on-screen pop-up box reminds you of the deal, and clicking on a “Get Offer” button in this box inserts the needed coupon code in the correct place. The app also can auto-fill your name, ship-to address, billing address and credit card information, if you’ve enabled this feature. Currently, Billeo will reveal offers from more than 1,500 retailers and the loyalty programs of American Express and Visa. Developed by Billeo for American Express, inSite is a browser app exclusively for AmEx Membership Rewards members. It works similarly to Billeo's Offer Assistant, but is specifically tailored to show Membership Rewards bonus points promotions in addition to discounts and other specials such as free shipping offers. inSite covers more than 250 brands including Banana Republic, Crate and Barrel and Barnes & Noble. Also, besides the search results functionality, the add-on will advise users of discounts when they visit participating websites. It is compatible with Firefox and Internet Explorer on PCs, and with Firefox and Safari on Macs. A "social deals" market website, Mertado offers exclusive time-limited deals to site members through e-mailed alerts and a Facebook app. Deals typically last for 24 hours or until Mertado's inventory of the product being offered is sold out. Mertado also rewards members with "Mertado Cash"––$1 points that can be combined with real money and applied to purchases on the site––for recommending deals to friends and referring them for website memberships. Beginning on Black Friday, Mertado will launch a new program that highlights weekly deals aimed at members trying to find gifts for hard-to-please people––at a variety of budget levels. The program will continue through the holidays. More than 700 retailers who are members of the National Retail Federation have come together to support CyberMonday.com, Shop.org's shopping website. It features a variety of promotional offers, including discounted prices and free shipping deals. An "Our Favorite Deals" section highlights 10 of the website's best deals, as picked by a team of its staffers, and a Top 10 Hottest Products section features the most popular products. On both the actual Black Friday and Cyber Monday days, a "Deal of the Hour" section will spotlight a different sale or promotion from a participating retailer every 60 minutes. Visitors to CyberMonday who choose to "Like" it on Facebook or follow it on Twitter also get a chance to win retailer gift cards, and those who register their e-mail addresses can be alerted in advance to the site's best deals. Fashionistas may want to look for deals on designer apparel at online boutiques we discovered last year. (See Get Great Deals at Designer Discount Sites). Thanks for the list of deals! Here’s another resource: If you find any product is sold out, you can use the free tool AZNotify.com to watch Amazon inventory and notify you with an obnoxious alarm the instant it comes back into stock so you can quickly buy it at the regular bargain price before it sells out again. I used the tool last year to snap up a laptop that was temporarily sold out. feels like cheating.